Here are a few letters from people who have added one of our Alaskan Malamutes or Belgian Sheepdogs to their families. They were so wonderful to write us these letters! Maybe yours will be here too! We purchased an Alaskan Malamute female puppy from Ric and Julie Edwards doing business as Ghost Dance. Our puppy (Sandia) has turned out to be a wonderful addition to our family. She quickly endeared herself not only to us but also to our 5-year-old Doberman. They have since become inseperable. Sandia is a quick learner she house trained within 2 weeks and already knows most common commands, she has such a sweet disposition, we call her our gentle giant. We are extremely pleased with Ghost Dance breeders they are the best in the business. They keep in contact even after the purchase and they are very caring and can be contacted for advice any time. When we are ready for another addition to our family, we will not hesitate to contact Ghost Dance for another wonderful puppy. 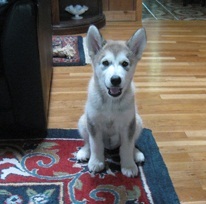 We instantly fell in love with our little Malamute puppy that Julie and Ric brought us. Over the course of the first year, we have watched our beautiful little puppy grow up into a loving and integral member of the family. I'm writing to you about Natchez. For being 5 years old, she's frisky as a pup. She's adjusting beautifully. Thank you for the chance to have her. She's brought a lot of happiness and mischief. Ha! Ha! She loves all the hugs and kisses she receives. It's funny how some always want puppies. I wouldn't trade an older dog for anything. A puppy can be so much more work. Natchez is well behaved and obedient and I could not ask for more. I can't say enough about Natchez, except that she's getting very spoiled and loving every minute of it. Thank you for my new best friend. Hello, just writing to let you know that Shadow is doing great. The kids love him and all their friends around the neighborhood. They come over just to play with Shadow. We take him for walks around the neighborhood and he does great. Our one year old is attached to Shadow. She cries everyday when we bring her in from outside because she wants to stay outside with Shadow. I feel like Shadow is the perfect dog for our family. Thank ya'll for letting this be possible. Viggo arrived at our home in Montana after a long flight from Texas in September of 2005. He popped right out of his kennel with a wagging tail, positive attitude and has been that way ever since. It was abundantly clear that this dog had been well bred (obedience was practically second nature to him) and very well cared for. He is a typical Belgian in that he is extremely intelligent, alert, curious and playful. He ADORES other dogs and is great with our two young boys. He was fairly easy to house train and he was first in his obedience class. This is partly due to the fact that he responds very positively to treats. He loves food (maybe a little too much) and in general is quite mouthy (likes to chew and will do so when bored so needs plenty of chew toys and lots of exercise.) He is a high energy dog. By this I do NOT mean hyper as he is clearly endowed with a thoughtful, clever, cool head. But I feel that one hour a day off leash is a requirement for this type of breed. He is very much a family dog and would definitely be unhappy if he were not a valued integral member of the family. He needs interaction to stimulate his active brain and meet his social needs. He is a beautiful dog with a lovely expression and very sweet disposition. I have wanted a BSD for years and I could not be happier with our Viggo. He has met or exceeded all my expectations. We cannot thank Julie and Ric Edwards enough for entrusting us with our precious boy! Here are some pictures of my sweet "Shadow." He seems to be a very happy boy. I enjoy having him. He will be five this Saturday, I can hardly believe it. Thank you so much for allowing him to come and live with me. We want to thank Ric and Julie for the beautiful, sweet puppy that has come into our lives. Julie was great to deal with. She answered all our questions and sent us loads of pictures along with notes about their personalities. 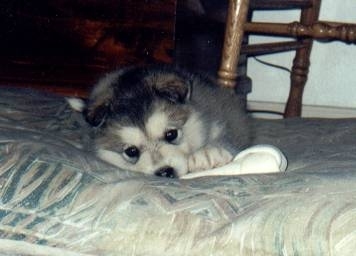 Like them we believe these Alaskan Malamutes are angels and it is important to raise them with love and kindness. This puppy got a great start as they found the time to play with all the puppies and get them ready for their permanent homes. This puppy is exceptionally smart and we have already begun her training. We appreciate that Julie carefully screens owners so these little angels go to loving, caring homes where they can be raised properly. Malamutes require lots of love and attention to make them bloom as great pets and owners willing to devote the necessary time to proper care and training will reap the rewards with an animal that will return their care and love a hundred fold. The dogs are meant to be a member of the family and owners who have never had a Malamute before will be amazed at their above average intelligence and will also discover they have quite a sense of humor. Julie and Ric met us at our motel in Alpine and brought other pups with them in case we decided that our first pick wasn�t the one. She was the one and we are thrilled to be her owners. One of us has been with her at all times so she has had 24/7 attention since we brought her home. We have owned Malamutes for over 35 years and would never own another breed. Thanks to Ric and Julie who are raising wonderful first class dogs. We have only had our pup for 2 weeks and we can�t imagine not having her in our lives. Watch Abby grow up on her website! I wanted to write to you about Spirit and the joy that he brings. When I went looking for a puppy, I had been having some bad experiences with another breeder and you were recommended. And I cannot say how glad you were! The process of getting a puppy from you, the answering of question after question, may be daunting to some people, but it just showed to me that you really cared about the dogs. You kept me updated as to his birth, growth, personality, etc�it was truly a pleasure working with you and I feel I not only got Spirit, but also a friend in you! Now, about Spirit. Everyone he meets he brings a smile to. My other two dogs, Kylie and Koda, just adore him. Koda, the other malamute, and Spirit are inseparable. I was not sure how Koda would handle him, but she just loves him. Spirit does like to pick on Koda to get her to playing, but it is all in fun. Everywhere I go with Spirit people just remark on how beautiful he is, but also how good natured he is. He is gentle with everyone and you can tell that he absolutely loves meeting new people. Spirit is just so joyful and people have remarked that his name fits him perfectly. He is so full of spirit and makes me laugh everyday with some new antic. 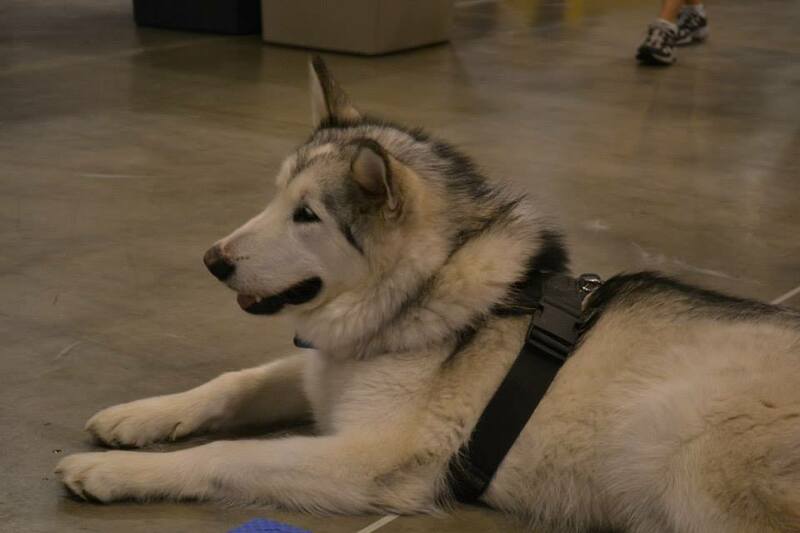 At the Reliant World Series of Dog Shows in July of this year, Spirit and I manned the booth for the Texas Alaskan Malamute Rescue and he was the perfect ambassador for the breed. He would sit in the walkway looking for his next victim to pet him. He was very gentle with kids of all ages, lots of kids, and nothing seemed to bother him. If someone just smiled at him he would get up and go over to them and they always left with a smile. And boy is he smart. I look into his eyes and worry what next mischievous thing he cooking up! Spirit may only be about 8 � months old right now, but it just seems like he has always been around. He still thinks he is a lap dog and I hope he always will be!